There are endless advantages to rolling when using an extension pole. The most important advantage is that they allow you to get the job done faster by being able to reach higher without wasting time. Extension poles allow two-hand control on your roller while you’re painting inside or outside the house. Plus, there’s nothing better than stepping back from the job you’re doing to see exactly what you’re covering. Accidental falls from ladders happen at an alarming rate. Using a pole reduces your chances of getting hurt while working on a project. There are many types of poles for many types of jobs. A 1-to-3-foot pole is excellent for closets, hallways or other tight areas. In addition, you can have the length without hitting the opposite wall. They also work exceptionally well for heavy furniture that’s difficult to move. The next pole is 2-4 feet, which is a really good size for interior walls that are 8-feet high. This size is perfect because you won’t have to stand on a ladder and it’s easier to carry when the pole is collapsed to only 2 feet. For painting ceilings, the 4-to-8-foot poles make it easier to reach over covered furniture. And the last poles are 6-to-12 or 8-to-16 feet. These poles are great for high interior walls and exteriors. 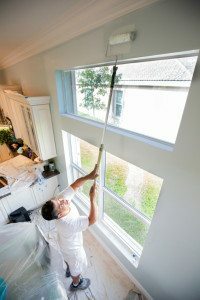 You can use a brush and tool holder with the pole or cut in the trim and corners and then reach the rest safely from the ground. I hope this will help you paint a little safer this year! If you’d like to get a bid on a paint project, feel free to give me a call. Ask for Brian “Boomer” Garleb at 618-282-3454 or try me on my cell at 618-972-9516. I’d be happy to look at your building and give you any recommendations. What’s more exciting than planning a new building project? Seeing what it looks like before it’s built! 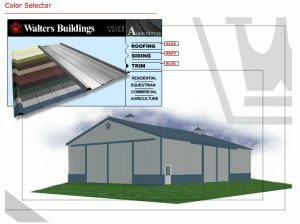 You’ll love the Walters Buildings’ online creative color guide that allows customers to mix and match potential colors of their new structure – whether it’s residential, equestrian, commercial or agricultural. You even get the color detail down to the roofing, siding and trim. Honestly, it’s fun just exploring the color combinations offered by Walters Buildings. If you’re in the planning stages of a new building, visit the Walters Buildings’ color guide and experiment with the color schemes for your very own structure. Even if you have no plans for a new building, we encourage you to try it out and experience it for future building purposes. For more information and tips on building your new Walters Building, contact FS Construction Services today at 866-551-3454. We’re here to help you through the initial planning and entire building process.